It was said that the tofu-making business originated from Mo village – Mai Dong (Hai Ba Trung district, Hanoi), created by General Tam Trinh from Hai Ba Trung period and handed over to villagers, and kept until today. Mentioning about tofu, people will immediately think of the small tofu pieces with light yellow and fragrance. With the same process and way to make tofu, tofu in Mo village is carefully filtered and wrapped so it is softer and fatter than tofu in other places. It is also said that tofu Mo becomes famous thanks to the soybeans cooked with the water of Mo village wells that make it have an especially delicious taste. The aroma of the tofu Mo is also different from tofu in other places. Making tofu is passed from generation to generation by people from Mo village. The process of making beans, grinding beans, wrapping, compressing, peeling tofu … are all done by the people here carefully in the small stages. The images of each hot tofu mold placed in the cotton in the wood mold have become familiar to many people in the village. Each piece of square tofu is squeezed tightly in the mold. The gourmets will easily notice that the pieces tofu Mo is light pink yellow color, cool, thick, fatty and has special aroma soy flavor. The square tofu with curved corner and with the flavor in each piece of tofu has made a fundamental difference in the tofu in the capital. Tofu makers get up very early, around 3 am to start their work. In order to have a good batch of tofu, the choice of soybeans is the first important period, the soybean must be carefully selected, the round, yellow beans will be dried, crushed to peel and then dipped to get juice. The beans are put in a canvas bag, squeeze the fiber, filtered out the juice which is cooked after that. This is the stage decisive quality of the tofu because tofu which is under-cooked or over-cooked is bad quality. The juice after that is poured into a large jar, cool down and mix with the sour water so that the tofu precipitated in to cake with light yellow, people often called “curds”. The tofu maker will use the round metal spatula to pick “curds” into a small napkin, then put it in a wooden mold. Tofu will be pressed into the mold, the time for this process usually takes about thirty minutes. After the press is finished, the tofu is put out the mold to cool down and peeled layers of “cloth”. This process is called tofu peeling. The finished tofu is still hot and ready to sold. If tofu would like to be sold immediately, people will go directly to the market, and in the afternoon, tofu will be put into cold water to preserve. Despite the elaborate processing, the tofu is the most popular dish on the list of Hanoi traditional food. With the Hanoians, regardless of the rich or poor, tofu, especially tofu Mo is still a familiar food, easy to eat and good health. 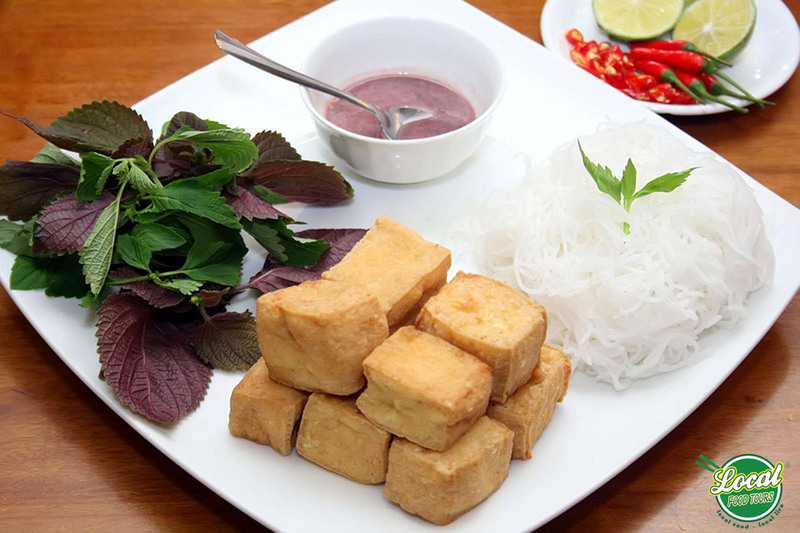 It is not accidental that a lot of dishes from tofu such as vermicelli with fried tofu, baked tofu … are listed on the delicious dishes of Hanoi. Being a rustic dish, with traditional thickness and brand which has been affirmed, tofu Mo village contributed to creating food Hanoi with the elite filtered from thousands of years. Now, when spring or festival, besides the drum beats of Mai Dong festival, there is still an image of the village making tofu, lively that bring the full life for many people sticking with the profession. As simple, elegant as the people of Ha Noi, tofu Mo has long been cherished by many customers who book the food tour in Hanoi because of the simplicity of each tofu piece. Also, the small pieces of tofu contribute variety, abundance in the list of cuisine in Hanoi.